One of the marquee features of the Galaxy S8 is Bixby, Samsung’s response to the Siris, Google Assistants, and Cortanas of the world. Billed as “a new way to interact with your phone,” Samsung has gone so far as to add a dedicated button on the side of the phone to summon its new assistant, and has integrated it deeply into the S8’s interface. There’s just one problem: You won't be able to talk to Bixby at launch. While the other Bixby features will be available, you’ll need to use them as you would any other app. For the AR-syle Vision, you’ll find an icon in the camera app that will call on Bixby’s services for translation, QR code detection, landmark recognition, and shopping. And the Home screen, which is sort of like Google Now, will still learn your routine to display messages, upcoming events, weather, and news. You'll also be able to set reminders, which "can include specific content like a video you want to watch when you get home," though it's not clear how it will work within apps without voice commands. Bixby Voice’s delay is surely frustrating but it’s not all that surprising. During Samsung’s hands-on demonstration of the service in late March, it showcased a controlled set of actions, and reporters weren’t allowed to test the feature. At the time, reps said the S8-exclusive service would support English and Korean languages at launch, with a goal of expanding it to more languages and devices. 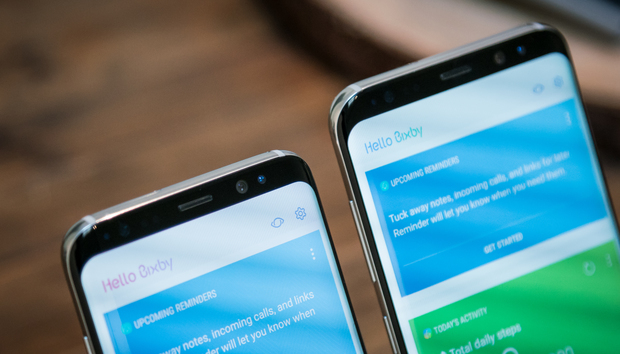 According to reports, Bixby will be able to converse in Korean at launch. Voice may only be part of what Bixby does, but in today’s AI world, it’s a major one. We’ve been trained to talk to our assistants, and we expect them to understand and respond as if we’re talking to one of our friends. Bixby not being able to understand English—at least enough to roll out for English-speaking users—is a major detriment to its adoption, which already faces serious competition in Google Assistant. Say what: The Galaxy S8 is one of the most exciting phones in years, and the lack of Bixby Voice at launch isn’t likely to change many minds about it. It still has Google Assistant on board (which most people were probably going to use anyway), and in the long run, it’s better that Samsung delays the service rather than release something that doesn’t work well. But Samsung is betting big on Bixby being a key component of its ecosystem, so it needs to get it right. And this isn't the best start.